It is as if people had worked for centuries to make the perfect picnic and finally found a way to have perfectly green grass at an even height, a climate controlled environment with sunlight and just the right amount of cloud, and many other things. Then people find that something is missing in the perfect picnic, and say that there might be wisdom in the saying, “No picnic is complete without ants.” So they carefully engineer a colony of ants to add to the picnic. An exercise program may be sought in terms of harmony with nature: by walking, running, or biking out of doors. Or it may be pursued for physical health for people who do not connect exercise with harmony of nature. But and without concern for “ascesis” (spiritual discipline) or harmony with nature, many people know that complete deliverance from physical effort has some very bad physical effects. Vigorous exercise is part and parcel to the natural condition of man. The disciples were joyous because the demons submitted to them in Christ’s name, and Christ’s answer was: “Do not rejoice that the demons submit to you in my name. Rejoice instead that your names are written in Heaven.” The reality of the disciples’ names being written in Heaven dwarfed the reality of their power over demons, and in like manner the reality that monks can be so much in harmony with nature that they can safely approach wild bears is dwarfed by the reality that the royal road of Ascesis can bring so much harmony with nature that by God’s grace people work out their salvation with fear and trembling. The Bible was written in an age before our newest technologies, but it says much to the human use of technology, because it says much to the human use of property. If the Sermon on the Mount says, “No man can serve two masters… you cannot serve both God and money,” it is strange at best to assume that these words applied when money could buy food, clothing, and livestock but have no relevance to an age when money can also buy the computers and consumer electronics we are infatuated with. If anything, our interest in technology makes the timeless words, “No man can serve two masters” all the more needed in our day. If we do not try to sate this urge with New Age, we can try to satisfy it with technology: in what seems like aeons past, the advent of radio and movies seemed to change everything and provide an escape from the here and now, an escape into a totally different world. Then, more recently, surfing the net became the ultimate drug-free trip, only it turns out that the web isn’t able to save us from finding the here and now miserable after all. For that, apparently, we need SecondLife, or maybe some exciting development down the pike… or, perhaps, we are trying to work out a way to succeed by barking up the wrong lamppost. When a Utopian vision dreams of turning the oceans to lemonade, then we have what has been called “a Utopia of spoiled children.” It is not a Utopian vision of people being supported in the difficult ascetical pursuit of virtue and ultimately God, but an aid to arrested development that forever panders to childish desires. 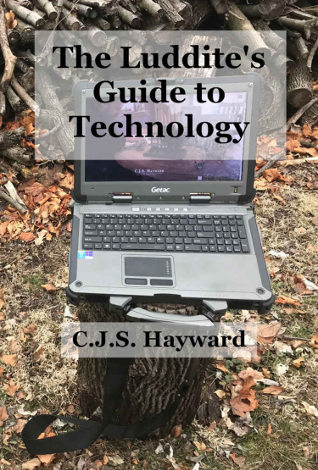 Technology need not have the faintest conscious connection with Utopianism, but it can pursue one of the same ends. More specifically, it can be a means to stay in arrested development. What most technology offers is, in the end, a practical way to circumventAscesis. Technological “progress” often means that up until now, people have lived with a difficult struggle—a struggle that ultimately amounts to Ascesis—but now we can simply do without the struggle. Statistically, people who switch to artificial sweeteners gain more weight. Splenda accomplishes two things: it makes things sweeter without adding calories, and it offers people a way to sever the cord between enjoying sweet taste, and calories entering the body. On spiritual grounds, this is a disturbing idea of how to “support” weight loss. It is like trying to stop people from getting hurt in traffic accidents by adding special “safety” features to some roads so people can drive however they please with impunity, even if they develop habits that will get them killed on any other road. What is spiritually unhealthy overflows into poorer health for the body. People gain more weight eating Splenda, and there are more ways than one that Splenda is unfit for human consumption. The Ascesis of fasting is not intended as an ultimate extreme measure for weight loss. That may follow—or may not—but there is something fundamentally deeper going on:Man does not live by bread alone, and if we let go of certain foods or other pleasures for a time, we are in a better position to grasp what more man lives on than mere food. When we rein in the nourishing food of the body and its delights, we may find ourselves in a better position to take in the nourishing food of the spirit and much deeper spiritual delights.Fasting pursued wrongly can do us no good, and it is the wisdom of the Orthodox Church to undergo such Ascesis under the direction of one’s priest or spiritual father. But the core issue in fasting is one that matters some for the body and much more for the spirit. Splenda and contraception are both body-conquering technologies that allow us to conquer part of our embodied nature: that the body takes nourishment from food, and that the greatest natural pleasure has deep fertile potential. And indeed, the technologies we call “space-conquering technologies” might more aptly be titled, “body-conquering technologies,” because they are used to conquer our embodied and embedded state as God made it. Today, “everybody knows” that the Orthodox Church, not exactly like the Catholic Church allowing contraceptive timing, allows contraception under certain guidelines, and the Orthodox Church has never defined a formal position on contraception above the level of one’s spiritual father. This is due, among other factors, to some influential scholarly spin-doctoring, the academic equivalent of the NBC Dateline episode that “proved” that a certain truck had a fire hazard in a 20mph collision by filming a 30mph collision (presented as a 20mph collision) and making sure there was a fiery spectacle by also detonating explosives planted above the truck’s gas tank (see analysis). Where is there murder before birth? You do not even let a prostitute remain only a prostitute, but you make her a murderer as well… Do you see that from drunkenness comes fornication, from fornication adultery, and from adultery murder? Indeed, it is something worse than murder and do not know what to call it; for she does not kill what is formed but prevents its formation. What then? Do you despise the gift of God, and fight with his laws? What is a curse, do you seek it as though it were a blessing?… Do you teach the woman who is given to you for the procreation of offspring to perpetrate killing? In this indifference of the married men there is greater evil filth; for then poisons are prepared, not against the womb of a prostitute, but against your injured wife. Augustine absolutely did not believe that one can enjoy the good of marriage and treat the blessing of marriage’s fertility as a burden and a curse. Such an idea is strange, like trying to celebrate the good of medical care while taking measures to prevent it from improving one’s health. Contraception is chosen because it serves a certain way of life: it is not an accident in any way, shape, or form that Planned Barrenhood advertises, for both contraception, “Take control of your life!” For whether one plans two children, or four, or none, Planned Barrenhood sings the siren song of having your life under your control, or at least as much under control as you can make it, where you choose the terms where you will deal with your children, if and when you want. Marriage and monasticism both help people grow up by helping them to learn being out of control. Marriage may provide the Ascesis of minding children and monasticism that of obedience to one’s elder, but these different-sounding activities are aimed at building the same kind of spiritual virtue and power. “Do not worry about your life, what you will eat or drink, nor about your body, what you will wear. Isn’t there more to life than food, and the body more than clothing? Look at the birds of the air. They neither sow nor reap nor gather into barns, and yet your heavenly Father feeds them. Are you not much more valuable than them? And why do you worry about the lilies of the field: how they grow. They neither toil nor spin;” they have joy and peace. The height of technological progress in having pleasure without losing control—in artificial sweeteners, contraceptives and anything else—utterly pales in comparison. The Harvard business study behind Good to Great found that the most effective companies often made pioneering use of technology, but technology was never the center of the picture: however many news stories might be printed about how they used technologies, few of the CEOs mentioned technology at all when they discussed their company’s success, and none of them ascribed all that much importance to even their best technology. Transformed companies—companies selected in a study of all publicly traded U.S. companies whose astonishing stock history began to improve and then outperformed the market by something like a factor of three, sustained for fifteen years straight—didn’t think technology was all that important, not even technologies their people pioneered. They focused on something more significant. Good to Great leadership saw their companies’ success in terms of people. In Robert Heinlein’s science fiction classic Stranger in a Strange Land, a “man” with human genes who starts with an entirely Martian heritage as his culture and tradition, comes to say, “Happiness is a matter of functioning the way a human being was organized to function… but the words in English are a mere tautology, empty. In Martian they are a complete set of working instructions.” The insight is true, but takes shape in a way that completely cuts against the grain of Stranger in a Strange Land. What SecondLife—or rather SecondWife—offers is the apparent opportunity to have an alternative to a here and now one is not satisfied with. Presumably there are merits to this alternate reality: some uses are no more a means to escape the here and now than a mainstream business’s website, or phoning ahead to make a reservation at a restaurant. But SecondWife draws people with an alternative to the here and now they feel stuck in. It is one thing to get drunk to blot out the misery of another’s death. It is another altogether to keep getting drunk to blot out the misery of one’s own life. An old story from African-American lore tells of how a master and one of his slaves would compete by telling dreams they claimed they had. One time, the master said that he had a dream of African-American people’s Heaven, and everything was dingy and broken—and there were lots of dirty African-Americans everywhere. His slave answered that he had dreamed of white people’s Heaven, and everything was silver and gold, beautiful and in perfect order—but there wasn’t a soul in the place! Today the older generation seems to grouse about our younger generation. Some years ago, someoone in the AARP magazine quipped about young people, “Those tight pants! Those frilly hairdos! And you should see what the girls are wearing!” Less witty complaints about the younger generation’s immodest style of dress, and their rude disrespect for their elders can just as well be found from the time of Mozart, for instance, or Socrates: and it seems that today’s older generation is as apt to criticize the younger generation as their elders presumably were. But here something really is to be said about the younger generation. The older generation kvetching about how the younger generation today has it so easy with toys their elders never dreamed of, never seem to connect their sardonic remarks with how they went to school with discipline problems like spitwads and the spoiled younger generation faced easily available street drugs, or how a well-behaved boy with an e-mail address may receive X-rated spam. “The youth these days” have luxuries their parents never even dreamed of—and temptations and dangers their parents never conceived, not in their worst nightmares. When they were young, the older generation’s ways of being rude included zoning out and daydreaming, making faces when adults turned their back, and in class throwing paper airplanes and passing notes—and growing up meant, in part, learning to turn their back on that arsenal of temptations, much like previous generations. And many of the older generation genuinely turned their backs on those temptations, and would genuinely like to help the younger generation learn to honor those around with more of their physical and mental presence. We may buy a product which carries a mystique, but not the mystique itself: and buying a cool product without buying into its “cool” is hard, harder than not buying. But if we buy into the cool, we forfeit great spiritual treasure. The Liturgy prays, “Pierce our souls with longing for Thee.” Our longing for transcendence is a glory, and the deepest thing that draws us in advertisements for luxury goods, does so because of the glory we were made to seek. But let us attend to living in accordance with nature. Ordinarily when a technology is hailed as “space-conquering,” it is on a deep level body-conquering, defeating part of the limitations of our embodied nature—which is to say, defeating part of our embodied nature that is in a particular place in a particular way. “The demons always fast:” such people are told to instill that fasting has a place and a genuine use, but anyone who focuses too much on fasting, or fasts too rigidly, is well-advised to remember that every single demon outfasts every single saint. But there is something human about fasting: only a being made to eat can benefit from refraining from eating. Fasting is useful because, unlike the angels and demons, a man is not created purely a spirit, but created both spirit and body, and they are linked together. Ascesisknows better, and is more deeply attuned to nature, to attempt to work on the spirit with the body detached and ignored. This is a fundamentally different matter from circumventing the body’s limitations. There may be good, ascetical uses for space-conquering technologies: but the good part of it comes from the Ascesis shining through the technology. Some might ask today, for instance, whether there might be something symbolic to the burning bush that remained unconsumed which St. Moses the Lawgiver saw. And there are many layers of spiritual meaning to the miracle—an emblem of the Theotokos’s virgin birthgiving—but it is not the proper use of symbolic layers to avoid the literal layer, without which the symbolic layers do not stand. If the question is, “Isn’t there something symbolic about the story of the miracle of the burning bush?”, the answer is, “Yes, but it is a fundamental error to use the symbolic layers to dodge the difficulty of literally believing the miracle.” In like fashion, there are many virtuous uses of technology, but it is a fundamental error to expect those uses to include using technology to avoid the difficult lessons of spiritual Ascesis. To say that the Internet is much more mind-based than face-to-face interactions is partly true. But to say that a mind-based society is more fit for the human spirit than the timeless way of relating, in old-fashioned meatspace, is to correct the Creator on His mistaken notions regarding His creatures’ best interests. People still use the internet all the time as an adjunct to the timeless way of relating. Harmony with nature is not disrupted by technology’s use as an adjunct nearly so much as when it serves as a replacement. Pushing for a mind-based society, and harmony with nature, may appeal to the same people, especially when they are considered as mystiques. But pushing for a mind-based society is pushing for a greater breach of living according to nature, widening the gulf between modern society and the ancient human of human life. There is a contradiction in pushing for our life to be both more and less according to nature. There is an indirect concern for Ascesis in companies and bosses that disapprove of clock watching. The concern is not an aversion to technology, or that periodically glancing at one’s watch takes away all that much time from real work. The practical concern is of a spiritual state that hinders work: the employee’s attention and interest are divided, and a bad spiritual state overflows into bad work. Nepsis is a watchfulness over one’s heart, including the mind. Nepsis is both like and unlike metacognition. It observes oneself, but it is not thinking about one’s thinking, or taking analysis to the next level: analysis of normal analysis. It is more like coming to one’s senses, getting back on course, and then trying to stay on course. It starts with a mindfulness of how one has not been mindful, which then flows to other areas of life. That “something better” is ultimately Christ, and a there is a big difference between a mind filled with Christ and a mind filled with material things as one is trying to flee malaise.